Crystal Bed Healing is a remarkable healing technique developed by one of Brazil's most remarkable healers, The crystal bed healing is a combination of crystal therapy and color therapy, both of which utilize spiritual healing. I started his healing clinic when I discovered that, by opening himself up to divine love, and universal positivity. These energies are to heal people. I remain modest "I do not cure anybody. God heals, I am merely an instrument in God's divine hands." What makes the Crystal Healing Bed so special is that only practitioners who have visited the Casa, witnessed and/or received healings themselves are given permission to own and use this very special form of healing outside of the Casa. While I was receiving a healing at the Casa, I heard the voice of God directing me to take one home and open a healing center in the United States. Now, in West Hillls, California, individuals can come experience the magnificent clearing and transformative capabilities of the Crystal Bed. 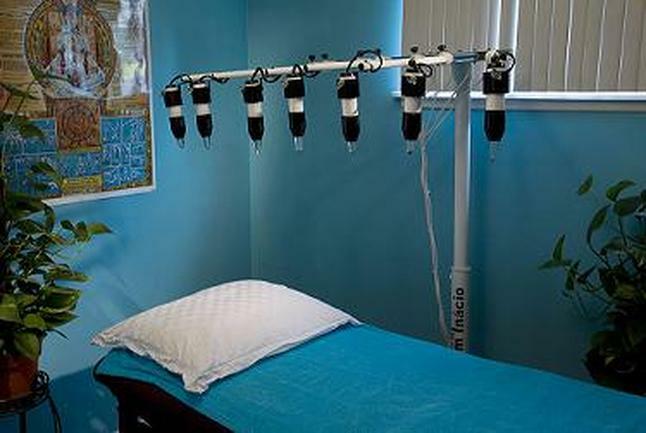 However, obtaining one of these healing beds was no ordinary feat! It took two trips to Brazil, lots of praying, and knocking down the door where the beds were kept (John of God was out of town and no one had a key). My prayers were answered when, 15 minutes before I was to catch a cab to the airport to fly home, it was suddenly placed in my possession. But it was worth all the effort, because the Crystal Bed is such an enjoyable and effective healing tool that I'm delighted to share with my clients. The Crystal Bed is a healing tool that uses specially cut and lit clear quartz crystal from Abadania, Brazil. The crystals are positioned over the seven major energy centers, commonly known as "chakras". Pulsating colored light is transmitted through the crystals to bathe each chakra in a pattern of healing light. Crystal Bed healing has been reported to have a positive overall effect on physical, emotional and energetic levels. It has also been reported by users to nourish, revitalize and balance their general well-being, as well as heal specific ailments and aid them in manifesting their prayer requests. 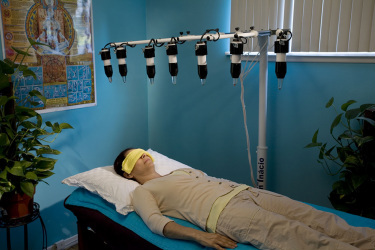 Crystal Bed healing is non-invasive and has no contra-indications. The person remains fully clothed and an eye mask is placed over the eyes. The room is then darkened and the colored light bathes the individual chakras of the body. Gentle, relaxing music is played throughout the session. A Crystal Bed session can be enjoyed in time increments of 20, or 40 minutes.